Follow the basic Victoria sandwich recipe to the end of Step 1 using 2 x deep 20cm round cake tins. Then place 300g Waitrose Continental Plain Chocolate, broken into pieces, in a large heatproof bowl with 100ml milk and melt over a pan of barely simmering water for about 5 minutes, stirring occasionally until smooth and glossy. Lightly stir the chocolate mixture into the basic cake mixture, folding together until just marbled. Pour into the tins and bake for 35-40 minutes until springy to the touch. To decorate, melt 400g Waitrose Continental Milk Chocolate, broken into pieces, in a large heatproof bowl over a pan of barely simmering water for 5 minutes, stirring occasionally until smooth and glossy. Cool for 10 minutes, then stir in 5 tablespoons crème fraîche. Spread a third of the chocolate icing over one of the cooled cakes and sandwich together with the other cake. Spread a thin layer of the chocolate icing over the top and then coat the sides of the cake with the remaining icing. 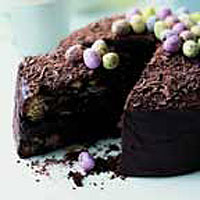 Sprinkle 5-6 tablespoons The Chocolate Society Pure Chocolate Flakes or 2 crushed Cadbury's Flakes over the top of the cake. Then arrange some Cadbury's Chocolate Mini Eggs from a 264g bag (available until 19 April) over the top. This cake can be kept for up to 4 days in the fridge. Preheat the oven to 180°C, gas mark 4 and place a shelf in the centre of the oven. Butter 2 x 20cm round cake tins and line the bases with baking parchment. In a large bowl, beat the butter and sugar with an electric hand whisk until pale and fluffy. Add the eggs, one at a time, beating well after each addition. Sift in the flour and gently fold in with the milk and vanilla until just combined. The mixture should drop off the end of the spoon when tapped. Pour the mixture into the tins. Level the tops with the back of the spoon and bake in the centre of the oven for 20-25 minutes until springy to the touch. Allow the cakes to stand in the tins for 5 minutes, then turn out onto a wire rack and leave to cool. To serve, sandwich together with cream and raspberries, then dust with icing sugar (this cake will keep for 1 day in the fridge).